How Much Does a Katana Weigh? 1400 Gram Correct or not? If you are Japanese, you must know well about katana. Historically, this was one of the Japanese traditional swords. The swords were used by the samurai of the feudal and ancient Japan. It is famous for the impressive appearance with a curved, single edge blade which has the circle or square board and the long grip to fit two hands. These swords are extremely heavy. However, have you ever wonder why the people can hold it? I see a thousand of questions about the weight of katana. Thus, I want to show you how much does the katana weigh and help you to understand more about katana. There is some difference between the katana in the past and the modern katana. In the century of 14 to 15, katana blades had the lengths about 70 to 73 centimeters, In the late century of 16, the average length increased by 13 cm, so it returns to 73 cm. It is thick and quite heavy about more than 1, 4 kilograms. Kanata used to be ban in some countries, but it has been produced again. It has the revolution and lighter in the past. Now, you can buy the lighter with just 900 to 1000 grams. 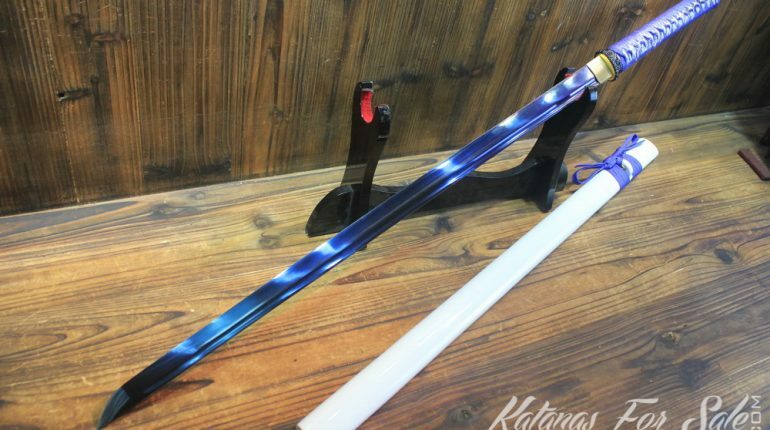 However, there still are a lot of heavy weight Kanata swords on the market. Begin with POB, 4-6 inches is the typical number. 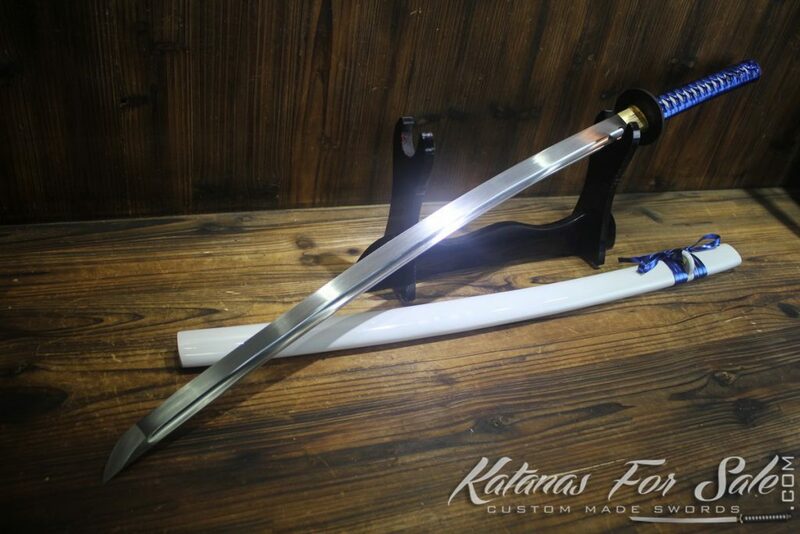 The katana blades are on par with a handed European sword in length with two handed grips in the case of being heavy blades. It means that the Kanata is shorter than the European one, but the weight is the same. The European sword has the length of 80 to 110 cm in blade length while the Kanata just has 55-70cm of long blade. However, the weight is the same about 1100 to 1400 grams. I can claim that katana is heavy in that size. In term of stiffness, Kanata normally laminated and different hardness, so it has a soft spine and the hard edge. It means that it does not like flexing, but once it flexes, it still can be bent. Besides, because of the short length, it is quite thick, even right up to the tip and it has a spine which can stay fairly uniform in thick level in comparison with the European sword that tends to have the greater distal. 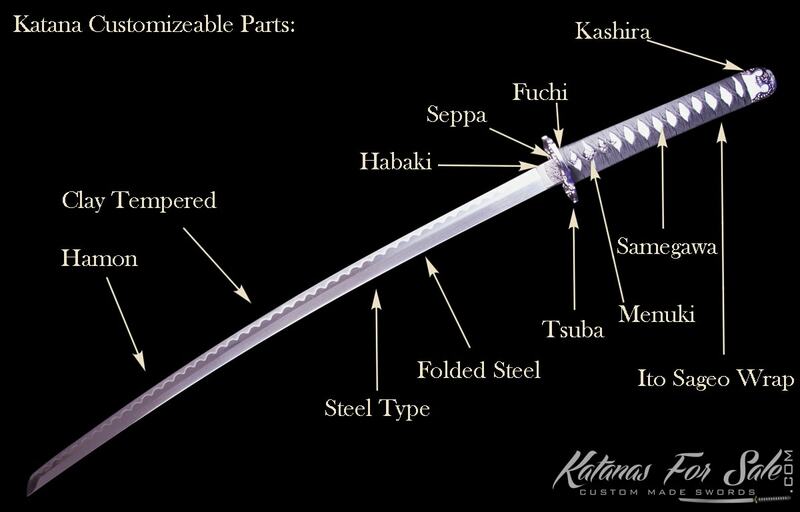 It can say that katana is one of the most desirable swords in the world. It has been found after for generations and honor as the soul for samurai. It brings thousands of traditional values. It is not only the object of martial tradition but also is the artistic work. Because of weight, Kanata tent to have the balance point further than the European double edged arming one. Thus, it can focus well on slashing much more than thrusting. Depending on Kanata’s blades geometry this sword can be created in a manner where even the tip can supply the serving slash or even has the chisel kill triangular tip for the strong thrust. Firstly, you have to see the information about katana on the Internet. You must read from the cheaper one to the expensive one. Then find out what is the best price for your choice. One thing to note is that Kanata is the high price product. Thus, the first thing is that take a look at your self and what is your needs. If you use your Kanata for cutting practicing, the bamboo or tatami mats. You want at least the maru blase of high carbon steel along with the highest carbon content you can 1095 which is the highest and the best you can select. You should avoid the new Swedish powered steel designated ASSABK 120-C which is pure and of all the steels out today. It can hold the hardest edge above 60 to 62 while other stalls just stop at 59 RC. You should advise of the sensei before you want to buy a katana. However, if you can, I will give you my experience about it. I suppose that the best way to measure yourself for a blade is the tsuka to arm’s length ratio. This method is related to using the length of your arm to get the idea of how long the tsuka can be. To do this, you need a simple measuring tool. Then you get out the tape measure or ruler and then measure the length of your forearm. After that, you see the distance from your elbow to your wrist. This is the distance of the tsuka. It can not be perfectly correct, but it always to perfect within plus or minus an inch. Mostly the katana has 11 tsuka so if you are not either very short or tall you would go with an 11. In conclusion, Kanata is the great weapon for those who are interested in swords and martial and Japanese culture. I have to say that the modern katana has a lot of difference from the past. It is much lighter than the past. However, it still stays the design.